Did you start needing glasses to see far away as child or a teenager, and your prescription for glasses just keeps getting worse every year? Then I’m sure you’re pretty curious about what causes myopia and what you can do to stop it from getting worse. In this article I will discuss myopia and the things that are currently understood to cause it to progress, as well as some things you can do the prevent it from getting worse. First of all, let’s clear up the wording because it can be a little confusing. The terms myopia, nearsightedness and shortsightedness all mean the same thing. They refer to the condition i.e., I have myopia. I have nearsightedness, I have shortsightedness. The terms myopic, nearsighted, and shortsighted also all mean the same thing. They just refer to somebody who has the condition i.e., I am myopic, I am nearsighted, I am shortsighted. Myopia is condition that affects your eyes ability to focus well on things in the distance, creating blurred vision. All myopes (another way of referring to people with myopia) have something called a far point. The far point is the distance from the eyes where a myope can still see clearly. So generally speaking, we can say that all myopes see blurry at distances further than their far point, and see clearly within the far point. The reason for this is that the focusing elements of the eyes (the cornea and the crystalline lens) are not able to focus the light entering the eye onto the retina. The cornea is the circular clear curved layer of tissue at the front on the eye. It is the part of the eye that you put contact lenses on. The crystalline lens is hidden inside the eyes. It is also clear and curved and it is flexible, meaning it can become more or less curved depending on what the eyes are looking at. 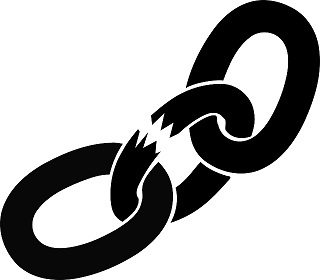 This is possible because it is connected to a muscle called the ciliary muscle, which will become very relevant to our discussion later on. 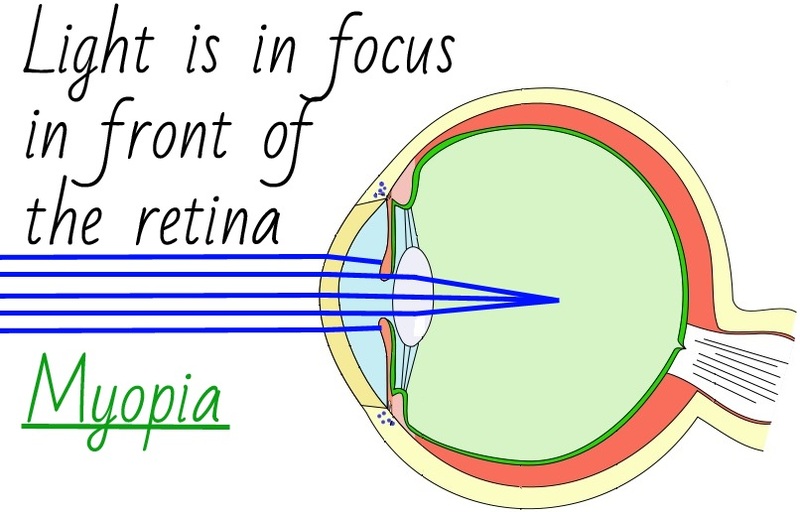 The retina is a thin sensory layer that lines the inner back wall of the eyes. It is responsible for transforming the light that enters our eye into a signal for vision that is sent to the brain. 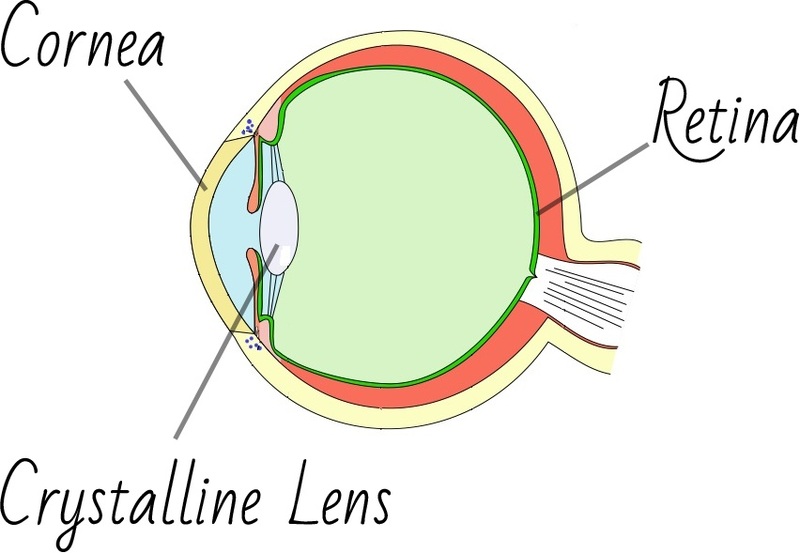 A cross section of the eye with the cornea, crystalline lens and retina labelled. If you’re not familiar with how these structure work together to give us vision, check out this video. I chose to show this kids video, not to be demeaning, but because explains how the eye works very well. If the cornea and the crystalline lens are able to focus light onto the retina, the eye will see clearly. Light ray diagram showing how light focuses in a perfect eye. If the cornea and the crystalline lens are not able to focus light onto the retina, they eye will be myopic. 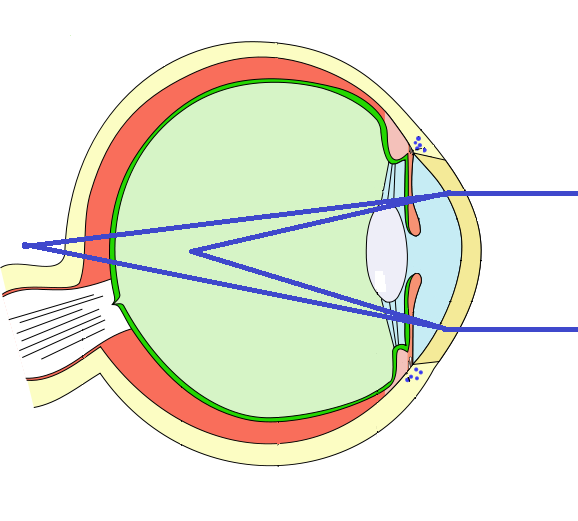 Light ray diagram showing myopia. When this happens, we must place glasses or contact lenses in front of the eye to refocus the light onto the retina. 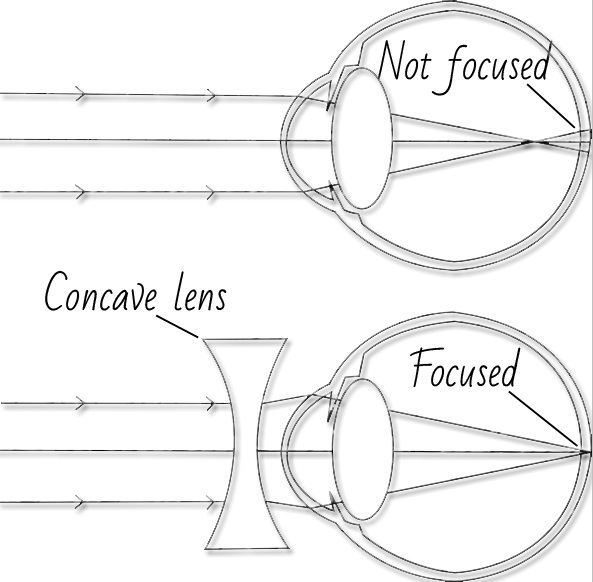 A concave lens will shift the focus from in front of the retina, to onto the retina. The truth is that the causes of myopia are to this day, not fully understood. But here is the current understanding. It has been shown that parents who are myopic are more likely to have children who will also become myopic. Children born of parents who are both myopic can have up to 60% odds of becoming myopic. This drops to about 40% if only one parent is myopic, but even when both are not myopic, there is still a 15% chance the children will be. It’s important to note that the genetics are probably quite complex. There is not a single gene that determines whether or not you will become nearsighted. The genetic component most likely resides in a host of genes which determines your susceptibility to becoming nearsighted. But what actually causes you to become nearsighted is more likely to be combination of your gene-driven susceptibility and your visual habits. This is where our earlier discussion of eye anatomy becomes relevant. To understand how our visual habits affect myopia, we have to understand how vision works. The term emmetropia refers to an eye that has perfect vision (no nearsightedness, farsightedness, astigmatism etc.). An emmetropic eye can see clearly in the distance and up close. When an emmetropic eye is looking in the distance, it is completely relaxed. When an emmetropic eye is looking up close, it requires effort. The effort comes from the ciliary muscle straining in order to change the shape of the crystalline lens. When the shape of the cyrstalline lens changes and becomes rounder, the eye is able to see well up close. The strain on the ciliary muscle that is the result of looking up close is the key to the development of myopia. The ciliary muscle is not a very strong muscle, and will get very fatigued if it is over used. Overuse of the ciliary muscle results from looking up close for too long i.e., from tasks such as reading, being at a computer, looking at smartphone, tablet, laptop, etc. This is referred to as doing too much near work. The longer the eyes are under strain from doing too much near work, the more the eyes will begin to “think” that looking up close is the natural state for the eyes, and it will try to change in order to relieve the constant stain that is experienced from all of the near work. Without going into too much of the optics behind this, it turns out that when the eyes grow longer, it helps us to see better up close without needing the employ use of the ciliary muscle. In other words, doing near work becomes effortless for the eyes. However, the flip side to that is that by grown longer, the eyes do not see as clearly in the distance. The second this happens, you’ve become nearsighted. Unfortunately, when the eyes grow longer, it’s a way one street. They can not ‘un-grow’ at a later time. The change is permanent which is why once you become nearsighted, you will generally require glasses or contact lenses for the rest of your life (unless you get laser surgery). Now, if you’ve followed the logic so far, you might be asking yourself a question. If the eyes grow longer in order to see better up close (at distances where we normally hold things like books, phones tablets, etc), then why does it keep going until nothing is clear unless you hold it just a few inches from my eyes? That’s an excellent question that really gets to the root of the problem. Let’s explore what leads to this. In the world of vision, we use something called diopters (D) to measure the focusing power of eyes, glasses, contacts, etc. 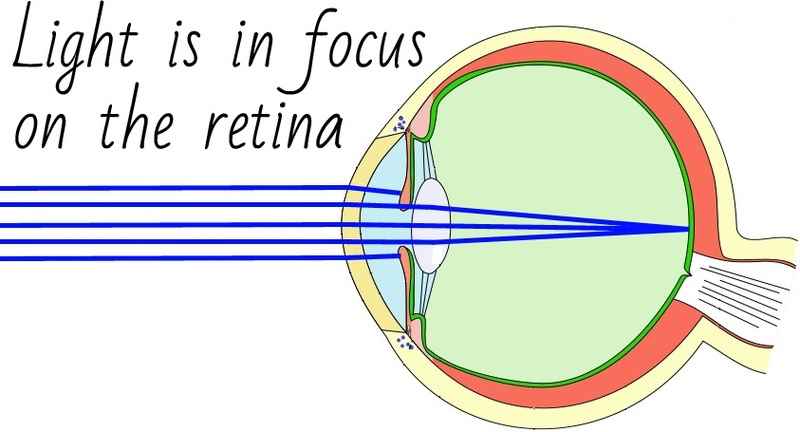 When the eyes are looking at a distance of about 40cm (16 inches), which is where most near work is done, they require about 2.50 D of focusing power. Constantly exerting this 2.50 D when doing near work is what’s going to lead to strain and stimulate the eyes to grow. When the eyes have elongated to a length which requires absolutely no effort (0.00 D) when looking at 40cm/16inches, they should theoretically stop elongating (remember that it is thought that strain induced by looking up close is what stimulates the elongation. No strain, means no more elongation, theoretically). The trouble is that once the eyes have reached a length where no effort is required at 40cm/16inches (which originally required about 2.50 D) the eyes have become -2.50 D myopic. This means that the vision when looking in the distance will be blurry. Elongation of the eyes is good for reducing the strain induced while looking up close, but it is bad for the vision in the distance. At this point, there is no choice but to start wearing glasses or contacts to fix the distance vision. It is near impossible to function normally as an uncorrected -2.50D myope. It would be impossible to drive safely, take notes in class, see the TV, etc. As soon as we put glasses in front of the eyes, we are neutralizing the nearsightedness. This means that the advantage the eyes have given themselves up close by elongating is gone. So when we resume all of our near work with the glasses on, the eyes will again be under stain, and will again start to elongate in an attempt to relieve the strain. If this goes on until the eyes reach a state of effortlessness while doing near work, the prescription for the glasses will have gone up another -2.50D. This puts us in the same position we were in before we started with the glasses in the first place. The vision with the glasses will be clear and effortless up close, but blurry in the distance. This means we have to increase the strength of the glasses again (this time from -2.50 to -5.00). By increasing the strength of the glasses, we are again neutralizing the nearsightedness, and the cycle starts all over again. That’s how you can end up with a prescription that’s so high that you can’t see anything without the glasses. Of course the glasses prescription doesn’t always only change in increments of -2.50 D. It depends on where you happen to be in this cycle when you get you’re eyes checked. If you have a yearly eye exam, it may change anywhere from -0.25 D to -1.00 D or even more depending on how fast it’s progressing. 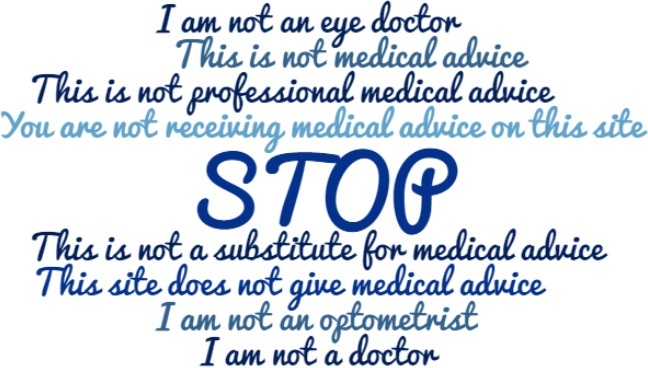 The solution is not to blame the glasses or the optometrist for the advancing myopia. When we become nearsighted, the glasses are necessary in order to function in our society. The solution is be aware of the cycle of myopia, and interrupt that cycle. The aim is to reduce the strain placed upon the eyes by doing too much near work, and this can be done in a few different ways. #1. If you’re still emmetropic, make sure you don’t put excessive amounts of strain on your eyes by doing too much near work. Near work should not last more than 20 minutes at a time. After 20 minutes, put down whatever you’ve been looking at up close, and let your eyes look naturally into the distance. This can be achieved by going outside, looking out a window, down the hall, or across the room. In fact, many studies have shown that children who spend more time outdoors tend to become nearsighted at lower rates than children who spend less time outdoors. This is because being outdoors allows the eyes to look into the distance, which relaxes the ciliary muscle. There is only so far that the eyes can see while indoors because there’s always a wall in front of us somewhere, but also, while indoors we’re much more likely to be doing things like being on a computer, tablet, smartphone etc. #2. If you are nearsighted and your prescription is between -0.25 D and -3.00 D, do everything mentioned in 1, but additionally, remove your glasses when you’re doing near work. Remember that you’re nearsighted because your eye elongated in order to make it easier for you to see up close without glasses. Use that to your advantage and keep your glasses off while looking up close. If you keep your glasses on you will be further stimulating your myopia to increase. #3. If you are nearsighted and your prescription is higher than -3.00 D, do everything mentioned and #1 and be particularly strict about it because you are definitely someone who is prone to myopic changes. Additionally, you would benefit from having a second pair of glasses made specifically for doing near work. These glasses would not hold your full distance prescription, they would be intentionally weaker in order not to strain your vision when you’re looking up close. Wear these reading/computer glasses whenever you you plan to be at the computer for a long time, or plan to sit down and read/study for a long time, etc. The information contained in this article if very important for parents of young children, particularly parents who are nearsighted. People between the ages of 5 to 25 are the most at risk for developing myopia and experiencing increases in their prescription. The goods new is that eventually for most people, myopia does stabilize. This usually happens in the mid twenties. Children today are doing near work much earlier in life than any previous generation. It is expected with the early use of smartphones and tablets, that we will see an explosion on myopia among children being born today. Employ the 3 points above to control myopia to prevent it from getting too strong throughout you or your child’s life. What I have just described is a general mechanism by which you can develop myopia and how it progresses. Certain people are more susceptible to entering and progressing through the cycle of myopia than others. That is determined by your genes. But with all of this said, there is still a lot that is not understood about myopia. The good thing is that there are now more ways of dealing with myopia than there has ever been. Contact lenses are a great way of correcting myopia and new and improved contacts are constantly being produced. What has been your/your children’s experience with myopia? 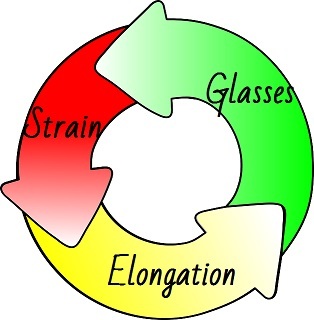 Do you think you got caught up in the cycle of strain –> elongation –> glasses –> strain? Do you have any useful tips for breaking the cycle? Please share in the comments below if you do! 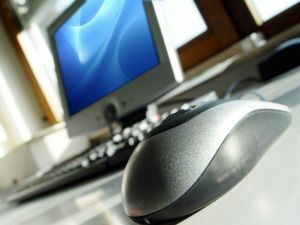 Is Being at the Computer Bad for Your Eyes? as someone who wears glasses I have never read a more detailed post on myopia. I like this 1,000 times if there was a button for it! Really well done, thank you! Hi Julie, Let me say that if anyone is looking for any sort of information on myopia, this is the only post they should read. 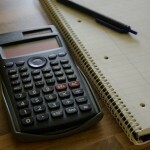 You have certainly broken it down in a manner that focuses on helping people take care of it. It’s really good that you mentioned how they can slow it down by giving solutions too. Thanks for sharing and all the best to you. Hi Julie, Very interesting and thoroughly detailed article, and I especially found the part about breaking the cycle relevant. Since I started my online work about 7 weeks ago, I have been guilty of spending too much time on the computer, doing close work, and believe me, I don’t take a break every 20 minutes. I’m nearsighted, and am aware of my near point, although never knew it had a name. I actually have an appointment for an eye exam next week, and I’m pretty sure my prescription will change for the first time in years. I’m going to hang on to your article and follow your tips. By the way, your images are fab. This is very interesting. I have had this problem since the sixth grade. My eyes have improved slightly in adulthood. I agree with the genetics of myopia. My mom has myopia and she passed it to me. I passed it to my son. He was just diagnosed this year. When I think back, that is the same time– I was diagnosed at the same age as my son. Thank you for the thorough explanation. 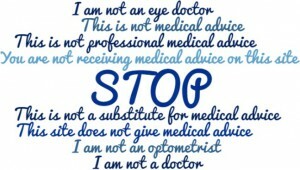 This is more than was told to me by my eye doctor. Hi Kristie! Children today have a lot more to look at up close than ever before. This can really ramp up the prescriptions if we don’t control the amount of strain we let them place on their eyes. Hope your son is doing well. Thanks for reading! I have had eye glasses for about 9 years now. I have always wondered why people always get worse eye sight when they wear eye glasses and need to buy stronger and stronger lenses all the time. My vision got slightly worse after getting eye glasses too. Thank god I have always insisted on not using them when not needed. Back when I was a child and got my first eye glasses, my parents insisted on me wearing them all the time, even when using computer (which is unbelievable since I had problems looking far away, not close). Thanks for the article! I will definitely make sure to avoid wearing eye glasses when not needed in the future as well. Hey Matthew! I think you had the right idea. Wearing glasses for far away when you’re looking up close can put undue strain on your eyes. It depends on how strong your prescription is, but if you can see well without glasses up close, it may be best not to wear them. Thanks for reading! Hi Bill, remember that it’s all about not over straining the eyes. Also keep in mind that luckily, over time, the cycle stops on its own as we age. It’s most active during our developmental years and as young adults. I can honestly say that this article on myopia was fascinating! You described me to a “t”! I was that kid who vision got worse every year! I have now been wearing contacts for about 20 years and I am at about -10.0 aka “half blind”. I remember an optometrist telling me not to wear my glasses all the time as a kid to “make my eyes work”. Well I get why now after reading what you wrote but I took his advice too literally. My prescription was probably at -5.0/-6.0 or so and I would not wear my glasses while crossing the street for example. I know…. But it is funny how we learn to compensate. I learned how to recognize people by their shape. I am super good at not bumping into things with my glasses because I go by the outline of things. But I remember the first time I wore contacts. It was a “and then there was light” moment! Great article! Your explanation was awesome! I know working in the industry I have had people ask me if glasses could make your eyes worse….I never thought they did. I was very happy that you could improve your eyes! I remember some people coming out of their exams with improved eyesight and I wondered how that was possible! I am going to try those excercises for the next year and see if my eyesight is improved. Hi Nicole, thanks for the compliment. Means a lot to me coming from someone else in the industry. If I may ask, what do you do? Wow. Thank you for your post. I am near sighted and wear my glasses whenever I’m awake. This article really makes me think. Great article! You explained things in a way that the reader doesn’t get lost. Also explains the theory of one optomotrist we’ve seen who intentionally under prescribed glasses correction. He felt this would make the eyes work more. Hi, great post, I learned a lot of things about myopia today. I know someone who thinks that he’s dealing with this problem, so I’ll definitely recommend your site to him. I think the cause in his case is genetic, his parents also have myopia, so this could be an explanation. I really love those drawings, it’s much easier to understand with them. I’ll get back to your site in the future, it’s very nicely designed. There’s a lot of bad information about myopia out there, including a lot of scam products that promise to restore perfect vision without glasses. I will soon be doing reviews of these products to give people the truth about them. So stay tuned!